Rangers clinched the Division 1 Championship title during the week after overcoming Airdrie in one of our most convincing performances of the season. Our captain Lee McCulloch scored a first-half hat-trick to secure the title – something Roy of the Rovers would have been proud of! 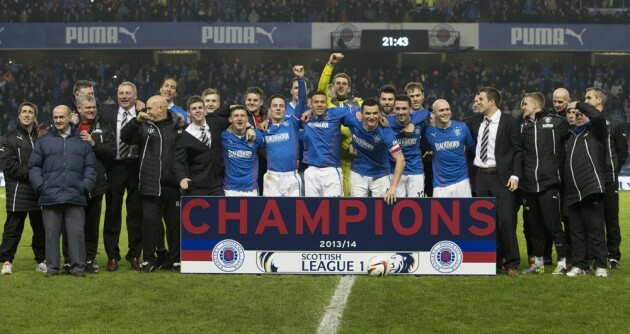 To date Rangers have played 28 matches, won 26 and drawn 2. We have yet to lose in the league whilst scoring 87 goals and conceding just 14 for a goal difference of +73. The match tonight kicks off at 8:30pm and will be shown live in the Trafalgar via Rangers TV. Off the pitch, Dave King has arrived in Scotland and has already held meetings with some of the shareholders in London as well as meeting the Union of Fans.